When I began researching my family history I discovered that there were few mementos from the past. There were no letters, only a few old photos—one may have been taken in the 1890’s, and only a few before 1930–a 1913 funeral receipt and an oil painting. 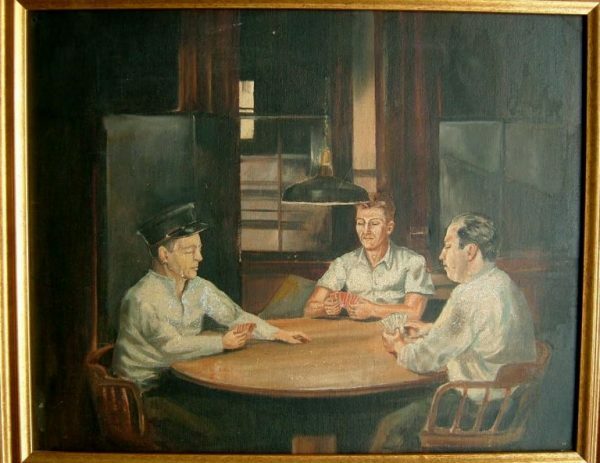 The painting captures a nighttime ritual, three NYFD firemen from Engine Co. 14, including my grandfather, (right), sitting around a table, playing poker. The painting hung on a wall in my grandparents’ NYC apartment and other than Grandpa Charlie using it as a prop for one of his riotous tales, I didn’t know much. I knew that a fireman, Edward Brady, painted it but I never gave much thought to the history of the painting. As I searched for links to the past–events that would elucidate my ancestors’ space and time–I began considering the painting. I imagined, given my grandfather’s appearance, that it was completed in the nineteen-forties. Once I learned that Edward Brady was a fireman at Engine 14 during the early forties, I was confident in my dating of the painting. 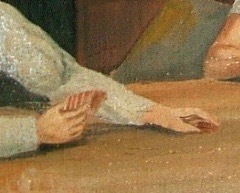 As I studied, what I call “Firemen Playing Cards” and American art and artists of that period, I also learned the history behind the style in which Brady painted. It was a school of painting, very different than a generation earlier, and a style that enabled Brady to capture that singular moment in my grandfather’s life. At the turn of the 20th century American Artists and photographers rebelled against the predominating art of aristocratic portraiture. A new style of painting developed, which was loose and impressionistic, and based on a new subject matter: modern life. Artists developed an interest in human elements: every day subjects in dramatic light. Art became a revelation of life’s experience, both the exciting and the mundane. This school of painting became known as Ashcan Art and included artists such as Robert Henri, John Sloan and George Bellows. 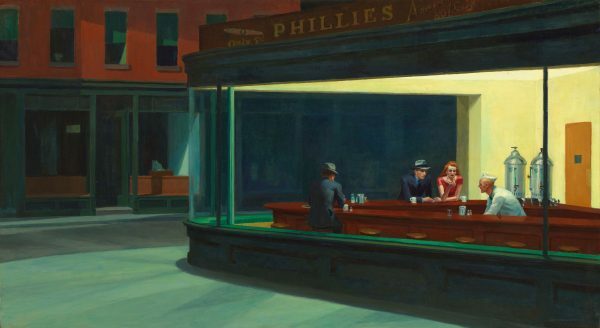 Two artists who were greatly influenced by this style of painting, both of whom were associated with New York schools of art during the developmental period of this style, were Edward Hopper and Guy Pene du Bois. As I studied “Firemen Playing Cards” in greater detail, I noticed that there was a similarity in style or at least a suggestion of Edward Hopper’s painting, “Nighthawks.” Deliberate and spare, each painting captures a singular New York moment in which three New Yorkers seem lost in their thoughts, anonymous and uncommunicative. The diner’s harsh electric light sets it apart from the dark night outside, as does the softer light emanating from the hanging lamp over the poker table. 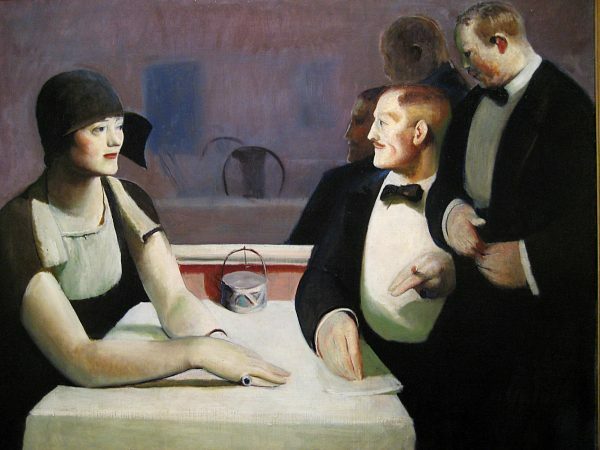 Brooklyn born, Guy Pene du Bois who, like his good friend Hopper, depicted narratives of inaction and themes of emotional disengagement, differed in style. While Hopper was interested in capturing moments of solitude, using bold, simplified forms to infuse his scenes with drama, du Bois used smooth curves striking a balance between abstraction and realism. And while at first glance there appears to be no similarity in Brady and du Bois’s work, there is one commonality: the hands. I’d always believed that Fireman Brady could not paint a pair of human hands. The firemen’s hands are nothing like I’d expect them to be, strong, large and rugged, but rather they look childlike and small. 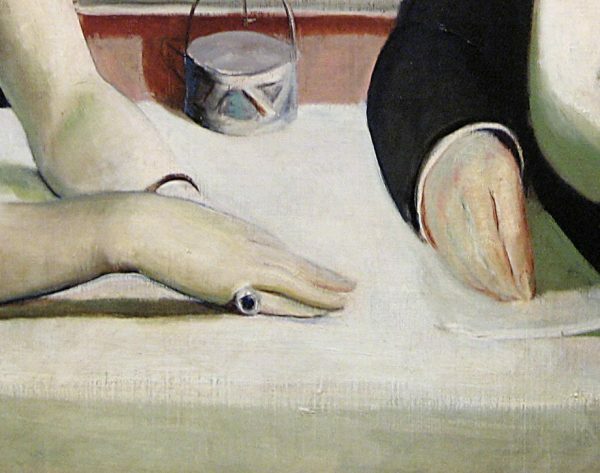 But then I look at the style in which du Bois painted hands and I wonder if Brady was familiar with du Bois? The hands are almost identical. Was Brady familiar with the school of painters who had studios on 14th St. and Union Square, a few blocks from Engine Co. 14, which is located on 18th Street. Did he take lessons at any of these art leagues? I don’t remember hearing Edward Brady’s name when I was a child. I noticed his name on the painting after his art was bequeathed to me a number of years ago. Looking through old firehouse logs of Engine 14 I was able to determine that Brady and my grandfather were fellow firefighters. And now I stare at the painting every morning, grateful that my grandfather’s friend, a man with whom he risked his life fighting fires, captured this singular moment in my grandfather’s life.